I knew July was going to be a heavy expense month because we made a huge grocery run and spent the night in Denali. I was VERY pleased to see, however, that despite those additional expenses we still covered our costs with work kamping revenue and even had a $277 surplus. We made $4,734 in work kamper revenue this month (it was a five paycheck month) and spent $4,457. Our budget for the month was $4,059 so we did go over budget by $398. I expected to cover the overage with a gift I received from my grandfather and a larger than expected tax return, but now that money can go directly into the general fund for a later date. A detailed accounting of the overages is listed below. Groceries – We went over $346.30 in this category because we made two big runs to Costco and Sam’s Club at the beginning of the month. After a few months with the membership, I am not feeling this club is really saving us money overall. Yes, we save on items like meat, but we end up spending more on luxury items. Plus, we are spending extra money on gas to get to the locations. I really need to see what it is like down in the lower 48 before making a final decision, but unless we can show more discipline when we go there, it’s not worth it to me. Lee on the other hand is very happy with the selection and the quality and that is no small thing. We just need to keep working at it. Dining Out – We went over in both dining out categories by a total of $222.74 because of our overnight trips. I packed lunches on the way to the locations, but then we picked up fast food on the way back. We also really splurged on a $100 dinner while in Denali which was largely mediocre and we definitely would not have done that if we had our rig with us. Entertainment – We went over by $308.21. The bulk of this overage was the one hotel stay night, and we also saw a movie in Fairbanks, which was unplanned. We did a ton of stuff over those days and most of it was free, which was really good. Truck Fuel – Despite the five week month and heavy traveling I was please to see we were only over by $44.27. This is mainly do to Lee being very careful about where we filled up. There is as much as a 50 cent per gallon swing between the towns (Palmer, Anchorage, Fairbanks, Wasilla, etc) versus the more outlying areas. By carefully planning where you fill up, and getting the absolute minimum amount of fuel when you can’t get the lowest price, you can travel and not break the bank. 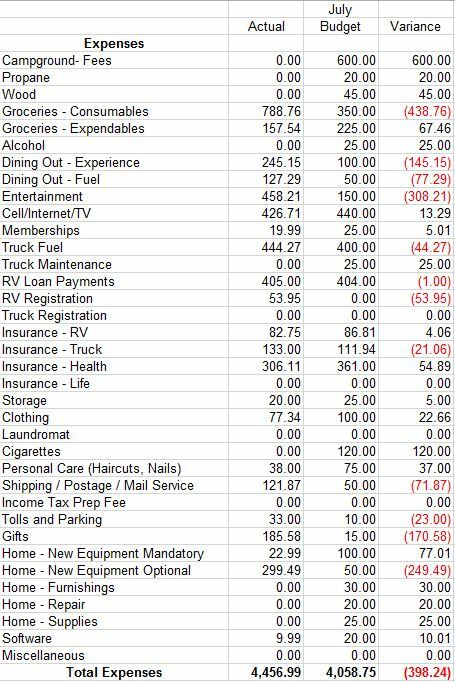 RV Registration – I had budgeted a couple hundred dollars for this in June and was very pleased that the cost was only $53.95. The process was also extremely easy. Lee went online, quickly renewed, and we received the tags right away. This is a nice boost to the annual budget and so much cheaper than the annual registration would have been in New Hampshire, which is one of the reasons we decided to change home states. Postage – We were significantly over on postage to the tune of $71.87. I don’t know if that is an Alaska effect or we are just being overcharged for our mail forwarding. Lee has promised to really dig into this and get a handle on it, but I know part of the problem is that when we need something sent we generally need it sent quickly which always ups the price. Gifts – We spent $170.58, but I actually put that in the positive column. I decided to buy all the Christmas gifts for my nieces and nephews in Alaska and have had a blast finding Alaska made items. Overall, even with postage, I am actually spending a little less than I normally spend and the kids are getting something super cool. Home Furnishings Optional – We went over in this category by $240, because I treated myself to the wooden bowl set. I consider this a gift from my grandfather, but since I did choose to buy the present I have included it here. Not only did we make enough wages to cover the purchase, but we also had a $97 offset by savings in the other home furnishing categories. So even though it was a high spend month I feel great because we both did really cool stuff and covered our costs. That’s a good month!! Next month we are taking 4 days off and going to Valdez with friends to celebrate my 50th birthday, and we will see if we can cover costs next month as well. This entry was posted in Lakeside and tagged Full Time Budget, Full timing budget, How much can I make work kamping. Bookmark the permalink. I have tried it a couple of time but they always leak on me. Any recommendations on that?? Really great info, thank you. Extraordinarily expensive, surprisingly high for RV living, but didn’t see much in terms of extravagance so it’s rather depressing. I live in stick and mortar for much, much less and supposedly RV living is cheaper. Looks like over 2 grand more expensive. Tracy – did you find your paying work kamping job thru Workampers.com? Or one of the free resources? And do you have your next one lined up already? Used work kamper.com for this one. We have our next couple of jobs lined up.